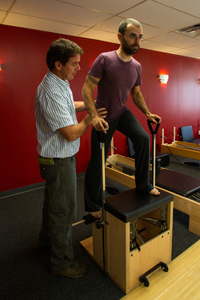 With over 45 years of combined experience in movement science, manual therapy, and the Pilates method we have the expertise to treat your condition effectively whether you’re in chronic pain or recovering from a recent surgery or injury. Our unique approach of integrating Pilates with manual therapy facilitates full restoration of your condition so that you can progress from rehabilitation to fitness as quickly as possible. At least 45 minute one-on-one sessions with a physical therapist. Comprehensive evaluations that encompass the whole body, not just an isolated part. Utilization of best-available evidence to guide our interventions. Education about your condition and the tools necessary to manage your condition independently. A physical therapist that relates to you with respect, humor and compassion for your condition. Find out more about our physical therapists by clicking their name below.